CSA Work Share Memberships are another way the community becomes a vital part of our mission. Your hard work helps make our shared harvest more cost-effective while giving you a first-hand look at how your vegetables are grown. + What are the benefits of a Work Share CSA Membership? As a Work Share Member, you will receive a $100 rebate off your share price after completion of 12 hours of work exchange. Just like other CSA shareholders, you’ll receive a weekly selection of freshly harvested, organically grown produce every week. You’ll also have the rewarding experience of working with our farm team, making friends in our farm community, and learning about growing and harvesting organic produce. + How do I purchase a Work Share CSA Membership? Just go to our CSA Registration Site and choose “Working Vegetable Share” as your membership type on the first page. On the next page, choose Cropsey Community Farm as your pick-up location and either Tuesday or Saturday as your pick-up day. + How do I fulfill my work exhange hours at the farm? Work will take place at Cropsey Community Farm in New City, NY. Every week we will have workshare hours on Tuesdays, Thursdays & Saturdays throughout the season. Tuesdays (2-5pm, or 5-8pm) & Saturdays (8-11am or 11am-2pm) we will need help with CSA distribution and helping other shareholders in the U-Pick areas. Thursdays are Farm Days where we will have you engage in field work or whatever needs to get done at the farm that day. If you sign up as a work shareholder, we will have an online calendar for you to sign up for work shifts in advance. When you arrive, simply sign in and out from your shift with a farm team member. You are responsible for assuring that your hours have been recorded and that you complete all of your hours by the end of the season. The first time you come to work, you must complete the Volunteer Information Form. Please sign all waivers & releases. Everyone working with you, whether or not they are a CSA member, must complete the forms before working on the farm. + I'd love to register for a Work Share CSA Membership, but I'm not crazy about field work. Are there any other work exhange opportunities? Yes! 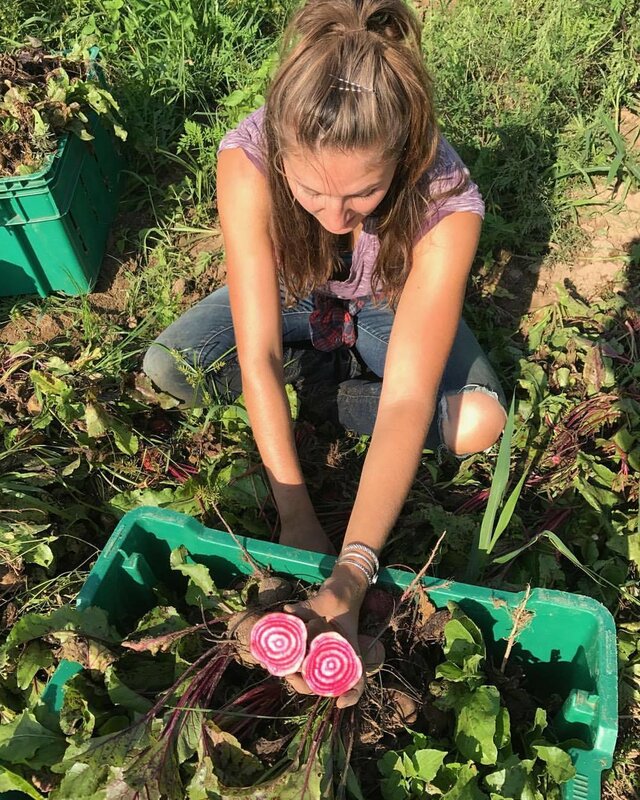 For those of you who are not interested in field work, some additional work exchange opportunities are available in helping distribute CSA shares on Tuesdays and Saturdays or helping set up and clean up from our annual Farm Dinner. Please contact csa@rocklandfarm.org for more information and to schedule one of these shifts. Upon shift completion, note any change in time and total hours worked and have your farm team supervisor initial next to the hours worked. + If I’m splitting a membership must I still work 12 hours? The 12-hour work requirement applies to the membership. So, if you’re sharing a membership, you and your partner(s) may split the work time between you as you choose, or not at all. + Can I bring someone else to work with me at the farm? Sure! Their work time will count toward your 12 hours. In the past, some CSA members have brought friends and family along and completed their work exchange requirement in one day! + Does work take place in inclement weather? Farm work is rain or shine unless lightening or other extenuating circumstances cause our Farm Manager to decide to cancel. + How should I dress/prepare for work at the farm? Since work takes place rain or shine please dress accordingly. Bring a sun hat, gardening gloves, boots or shoes you don’t mind getting dirty or muddy, sunscreen, bug spray, water, a snack and whatever else you think you need. We will provide any other farm tools that may be needed. If you’re allergic to bee stings, remember to bring your epi-pen, just in case! Park in the lower field directly across from the entrance to Red Hill Nursery and Cafe. There will be a "Parking" sign at the entrance. + When will I recieve my rebate? Rebates are given after the end of the season, upon completion of all work hours. Typically checks are mailed out by the end of the year.